For as long as we’ve been in business, we’ve been driven by a single goal: to add value to our clients’ real estate portfolio management process. Today, with over 110 million square feet of transactions on an annualized basis, it’s safe to say we’re meeting that goal. Our approach has always been consultative and with changes in workplace strategies and lease accounting, getting to an efficient real estate portfolio requires new systems, processes and strategies. The Lee Corporate Solutions platform was built to provide solutions for these fundamental changes in corporate real estate. We have structured a team to consult on workplace to keep you competitive, on lease accounting and administration to keep you in compliance, transaction management to keep in front of the occupancy curve and Project Management and Facilities Management to save you time and money. We don’t take a step until we’ve honed in on a client’s goals for aligning corporate real estate with the business objectives of the company. Then we use technology to track, measure, analyze and report our progress and identify effective cost-control measures. We’ve invested heavily in technology to make, and keep, our processes second-to-none. And, because our clients depend on timely reporting accurate financial data, Key Performance Indicators and portfolio performance, we’ve placed special emphasis on leading-edge mobile technology, for responsive and accurate reporting. Today’s economic realities have companies competing on a global basis for talent. The millennial generation is not only the largest generation of our life time (83.1 m) but they currently make up the largest portion of the labor force (53.5 m). To accommodate this generation and compete globally, many companies have embraced Workplace Innovation initiatives not only to address the needs of this generation, but enhance productivity as well. With this demographic shift, Corporate America and the real estate development community are building smart, efficient, socially responsible projects with elements of the live, work, play trends preferred by this generation. Workplace Innovation not only connects people to place, but also provides operational integrity that supports business operations. Specifically, our Workplace Innovation team addresses the vital component of a business’s operation and applies that knowledge to the real estate planning process. 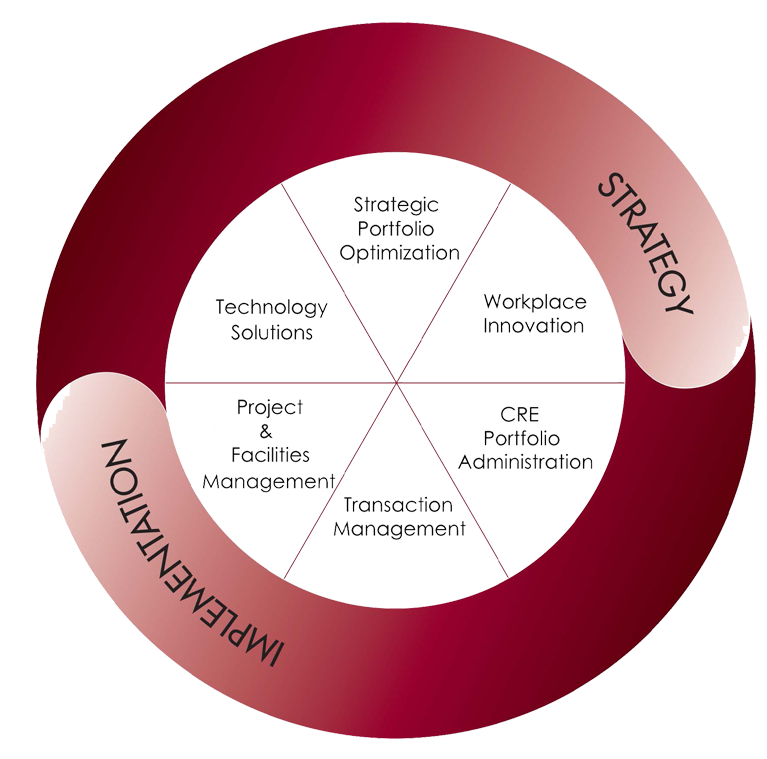 We incorporate a cross-disciplined team (Senior Management, HR, Finance, IT, Marketing, and Real Estate) within the organization to create a workplace strategy that supports the business need to compete for talent, improve operational efficiencies, incorporate new technologies and change work processes to support the company’s image, culture and growth. Effective Portfolio Administration starts with good information, good systems and a clear understanding of the pulse of the business. Our Corporate Solutions platform combines an effective Portfolio Optimization program and Workplace Innovation (specific to your business and company culture) with a way to measure, analyze and report the results. 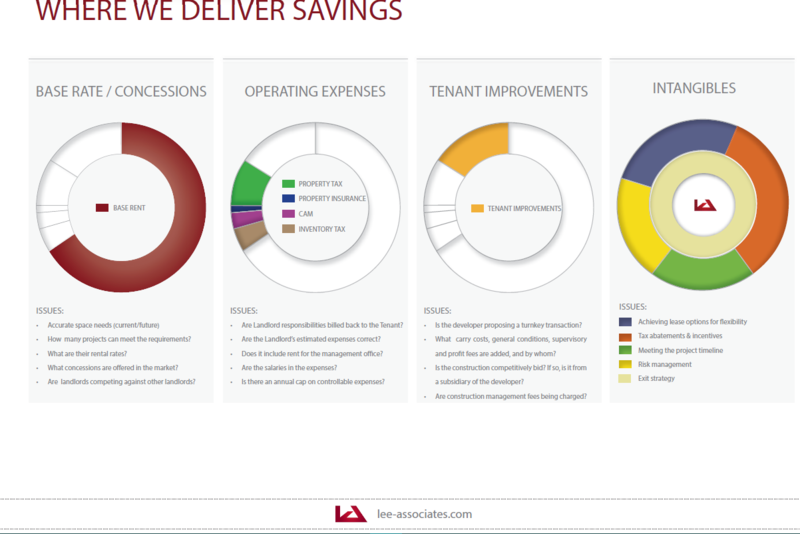 Our Transaction Management Playbook and quality control procedures makes sure that accurate data is used for the lease administration process, in compliance with the new lease accounting (GAAP Analysis). Our transaction support is designed to provide clean original and accurate data for input into the Portfolio Administration tools the company may select. This attention-to-detail and personnel alignment separates our services from a commodity to a value-add service. Many companies sell commodity services as value add, our Portfolio Administration process separates the two to deliver true value. 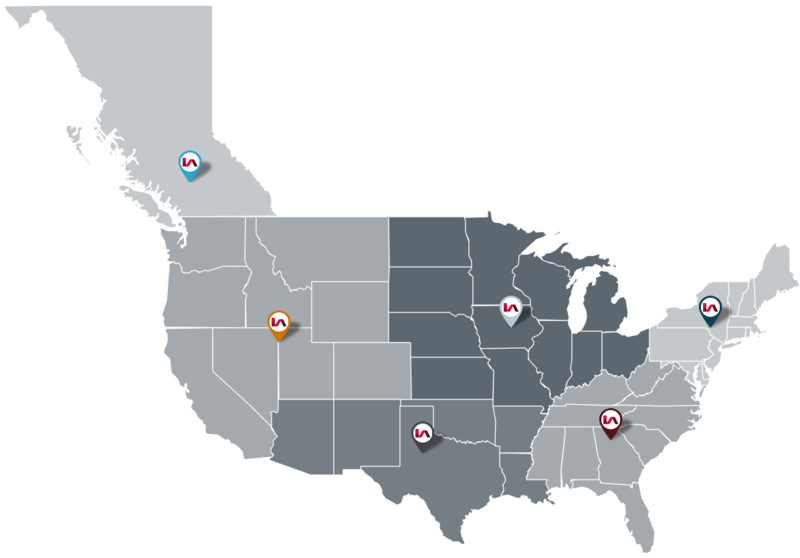 Our LCS team drives our clients’ Transaction Management strategy globally and regionally. We partner with local market experts to ensure we provide the best possible solution for our clients through minimizing occupancy costs, selecting the right site for your business, expanding, contracting or disposing of your facility, renegotiating a lease or opening a new location. We provide quality control guidelines to benchmark performance, savings and value. Occupancy needs arise and needs change, often quickly and without notice, the Lee Corporate Solutions platform can deliver a range of Project Management and Construction Management services for renovations, remodeling, additions, and ground-up construction. Our areas of expertise include industrial, office, retail, hotel, medical, and banking/financial. Our capabilities are not only broad in scope, but practical in execution—we can work with you in the way best suited to your needs: Design-build, General Contracting, and Construction Management. Our Facilities Management program provides our clients outsourcing, strategic sourcing (procurement) and technology to drive savings, implement standardization and minimize risk. We combine office services, maintenance and operations, financial and accounting proficiency and project management to deliver a full-service solution. Our approach combines the basic principles of sound plant maintenance, optimum asset utilization and efficient service delivery. We consult with our clients to gain a detailed understanding of their unique requirements, then assign a specialized team to their portfolio of properties, with a single point of accountability. Through our project tracking technology and our customer service center hubs, we offer around-the-clock execution and active measurement and management of operations. ePortfolio (Business Intelligence +TM automation): ePortfolio automates the Steps In The Real Estate Process (“S.I.T.R.E.P.”) and delivers strategic, real time information to all players engaged in the real estate process. Data Center Advisory focuses on improving the efficiency of our clients’ Information Technology spend. Our holistic approach takes into consideration your business objectives, real estate strategy, and the total cost of ownership (TCO) of IT assets to create a customized solution to achieve your goals. The result is a lower TCO, improved security, compliance, and contract flexibility, and a scalable solution enabling IT to focus on the user experience and the business to grow profitably. The Data Center Advisory team will assist with data center site selection, negotiation of co-location contracts, disaster recovery strategies, acquisition of Cloud infrastructure and telecommunication services, and the acquisition/disposition of data centers.